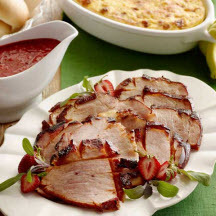 The sweet and spicy strawberry-chipotle sauce adds a festive, springtime flair to the traditional Easter holiday ham dinner. Make your favorite corn pudding recipe and steamed asparagus with butter and lemon to serve with this ham. For Ham: Preheat oven to 325°F (160°C). Position the rack in the lower third of the oven. Line the bottom of a shallow roasting pan bottom with aluminum foil. Score a diamond pattern into the ham, about 1/3 inch deep. Place the ham, flat side down, in the aluminum foil-lined pan. Place ham in preheated oven and bake until the internal temperature reaches 140°F (60°C) on a meat thermometer, 15 to 18 minutes per pound. Remove from oven and increase the heat to 400°F (205°C). In a small bowl, mix the agave (or honey) and smoked paprika. Brush sauce over the ham (not on the flat side), return to the oven, and bake until glazed, about 10 minutes. Remove from oven, transfer to a cutting board, and let rest 10 minutes. For Strawberry-Chipotle Sauce: In a large nonreactive saucepan, mix strawberries and sugar. Cook over medium heat, stirring occasionally, until strawberries give off their juices, about 3 minutes. Using a potato masher or a large slotted spoon, crush strawberries in the saucepan to make a chunky sauce. Stir in chipotle chilies, adobo sauce, and lemon juice. Simmer, stirring occasionally, until slightly thickened, about 5 minutes. Stir in sage. Transfer to a medium bowl placed in a larger bowl of iced water. Let sauce stand, stirring occasionally, until chilled. Makes 15 to 20 (4-ounce) servings. Nutritional Information Per Serving (4 ounces): Calories: 260 calories; Protein: 39 grams; Fat: 5 grams; Sodium: 1370 milligrams; Cholesterol: 100 milligrams; Saturated Fat: 1 grams; Carbohydrates: 15 grams; Fiber: 1 grams.